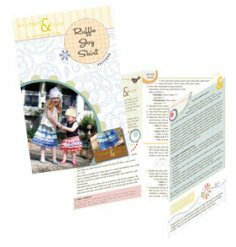 The bridget&lucy ladies are back again with a simple dress pattern using your jelly rolls! You know those jelly rolls you just can't throw away but don't know what to do with? We highlight them as the waist of this adorable dress using a repurposed t-shirt and a piece of 45" quilting fabric. 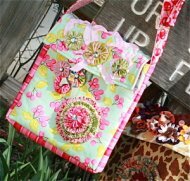 Kim Hayes and Megan Pederson are the mother/daughter team of bridget&lucy ... a pattern and clothing line. Kim's quilting and sewing background go way back (she made her own wedding dress and only hand stitches quilts) and she has been patiently teaching Megan the trade since Megan wanted to make her own headbands to match her outfits in junior high. The business, bridget&lucy, was inspired by Megan's children and Kim's grandchildren - Bridget and Lucy. 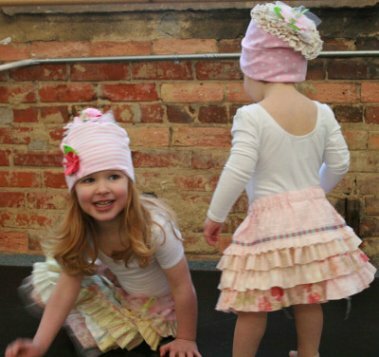 Their pattern business combines basic garment construction with quilting techniques to come up with adorable clothing and accessories mostly for little girls. Their patterns are sturdy, durable and of course, adorable (but we're not biased at all). Kim started quilting at age 28 - which was 30 years ago now (totally giving away her age here). She has taught quilting in various forms from block of the month classes to a 6th grade after school quilting project. Her quilting background influences the bridget&lucy pattern line in every design. Megan has yet to make her first quilt but loves using quilting products and notions to create clothing for her girls and gifts for friends. We would have to say our favorite is our first - the Ruffle Joy Skirt. This was the pattern that started it all. 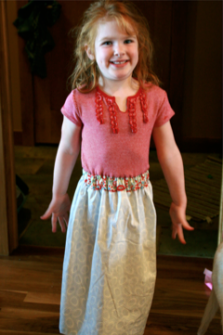 Kim made the first Ruffle Joy Skirt with muslin and jelly rolls. Bridget received so many compliments on the skirt we decided to make a bunch and host a sale at a friends' house. We sold out, the rest is history. We enjoy about anything creative under the sun - knitting, sewing, needlepoint, crafting of any kind, etc., etc. We both also enjoy reading, traveling, being outdoors in any way, enjoying our family, cooking, and so much more. And yes, we both really do enjoy mostly the same things - we know; very scary :). it for a much loved principal who was going to a different school. Working with the kids and seeing the expression on their principal's face all made it a wonderful experience. Well - this is definitely a family business so we'd love to tell you about them! Kim and Bob have two daughters - Megan and Katy. Megan is in business with Kim and Katy tries to stay far, far away from the crafting. 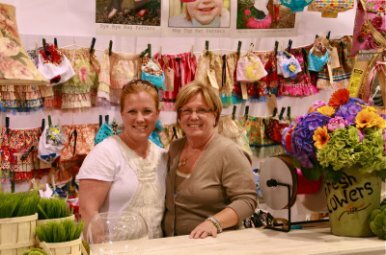 Katy is an amazing communicator and saleswoman and if you were at Quilt Market in the Spring you may have been lucky enough to chat with her. Megan and Bill have two girls, Bridget (4 1/2) and Lucy (3) - the inspiration for the business. They all live in Sioux Falls, SD and truly enjoy life to the fullest!